IBPS recruitment 2018-19 notification has been released on official website www.ibps.in for the recruitment of 4102 vacancies at Institute of Banking Personnel Selection. The candidate who is looking for Probationary Officer/Management Trainee (PO/MT) can apply online application from 14th August 2018 and before 4th September 2018. Qualification A Degree (Graduation) in any discipline from a University recognised by the Govt. Of India or any equivalent qualification recognized as such by the Central Government. Selection Process Selection will be based on Preliminary, Main Online Exam and Interview. 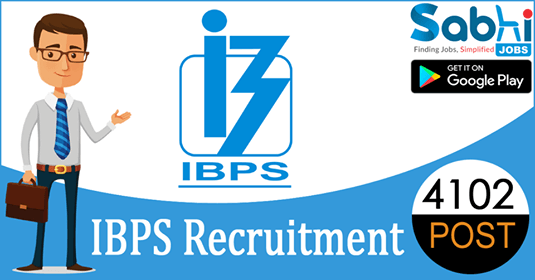 How to Apply Interested and eligible candidates may apply online application form at official website www.ibps.in from 14th August 2018 to 4th September 2018. Before applying for the post, the candidate should ensure that he/she fulfils the eligibility and other norms mentioned in this advertisement. Candidates are therefore advised to carefully read this advertisement and follow all the instructions given for submitting the online application. All the candidates who wish to apply under CRP-PO/MT-VIII are hereby informed that providing AADHAR number or AADHAR Enrolment number in the application, for CRP-PO/MT-VIII is optional. A Candidate’s admission to the examination/ shortlisting for interview/ and subsequent processes is strictly provisional. The mere fact that the call letter(s)/ provisional allotment has been issued to the candidate does not imply that his/ her candidature has been finally cleared by IBPS/ Participating Organisation. IBPS/ Participating Organisations would be free to reject any application, at any stage of the process, cancel the candidature of the candidate in case it is detected at any stage that a candidate does not fulfill the eligibility norms and/or that he/she has furnished any incorrect/false information/certificate/documents or has suppressed any material fact(s). If candidature of any candidate is rejected for any reason according to the terms and conditions of this advertisement, no further representation in this regard will be entertained. Such decisions shall be final and binding on the candidate. If any of these shortcomings is/are detected after an appointment in a Participating Organisation, his/her services are liable to be summarily terminated. Decision of Nodal Banks/Participating Organisations/ IBPS in all matters regarding eligibility of the candidate, the stages at which such scrutiny of eligibility is to be undertaken, qualifications and other eligibility norms, the documents to be produced for the purpose of the conduct of Examination, interview, verification etc. and any other matter relating to CRP-PO/MT-VIII will be final and binding on the candidate. No correspondence or personal enquiries shall be entertained by IBPS/ Participating Organisations in this behalf. The scribe arranged by the candidate should not be a candidate for the examination (CRP-PO/MTVIII). If a violation of the above is detected at any stage of the process, candidature for CRP of both the candidate and the scribe will be cancelled. Not more than one application should be submitted by any candidate. In case of multiple Applications, only the latest valid (completed) application will be retained and the application fee/ intimation charges paid for the other multiple registrations (s) will stand forfeited. Multiple attendance/ appearances in the online examination and/ interview will be summarily rejected/candidature cancelled. Any request for change of date, time and venue for online examination and interview will not be entertained. A candidate should ensure that the signatures appended by him/her in all the places viz. in his/her call letter, attendance sheet etc. and in all correspondence with the IBPS/ Participating Organisations in future should be identical and there should be no variation of any kind. Signature in CAPITAL LETTERS will not be acceptable. A recent, recognizable photograph (4.5cm × 3.5cm) should be uploaded by the candidate in the online application form and the candidate should ensure that copies of the same are retained for use at various stages of the process. Candidates are also advised not to change their appearance till the process is completed. Failure to produce the same photograph at various stages of the processor doubt about identity at any stage could lead to disqualification. The left thumb impression which is scanned and uploaded should not be smudged. The handwritten declaration has to be in the candidate’s handwriting and in English only. If it is written by anybody else and uploaded or in any other language, the application will be considered as invalid. The possibility of occurrence of some problem in the administration of the examination cannot be ruled out completely which may impact test delivery and/or result from being generated. In that event, every effort will be made to rectify such problem, which may include movement of candidates, delay in the test. Conduct of a reexam is at the absolute discretion of IBPS. Candidates will not have any claim for a re-test. Candidates not willing to move or not willing to participate in the delayed process of test delivery shall be summarily rejected from the process. Candidates will have to appear for the interview at their own expense. However, eligible outstation SC/ST/Persons with Benchmark Disabilities category candidates called for interview will be paid II class to & fro railway/ bus fare or actual expenses incurred, whichever is less, by shortest route on production of proof of travel (rail/ bus ticket etc.). The above concession will not be admissible to SC/ST/Persons with Benchmark Disabilities category candidates who are already in service in Central / State Government, Corporations, Public Undertakings / Local Government, Institutions and Panchayats etc. Nodal Banks/ Participating Organisations/ IBPS shall not be responsible for any application made/ wrong information provided by an unauthorized person/institution. Candidates are advised not to share/ mention their application details with/to anyone. Appointment of provisionally allotted candidates is subject to his/her being declared medically fit, as per any other requirements of the Participating Organisation and subject to service and conduct rules of the Participating Organisation. The decision of Participating Organisations to which candidates are provisionally allotted will be final and binding on candidates. IBPS has no role to play here. Any queries in this regard are to be made to the Participating Organisations only. IBPS reserves the right to change (cancel/ modify/ add) any of the criteria, a method of selection and provisional allotment etc. Intimations will be sent by email and/ or SMS only to the email ID and mobile number registered in the online application form for CRP- PO/MT-VIII. IBPS shall not be responsible if the information/ intimations do not reach candidates in case of a change in the mobile number, email address, technical fault or otherwise, beyond the control of IBPS and candidates are advised to keep a close watch on the authorised IBPS website www.ibps.in for latest updates. Order of preference for Participating Organisations has been inbuilt in the online application form. Candidates should necessarily indicate their order of preferences at this stage. No request for a change in this connection shall be entertained. If at a later stage of selection process or appointment, the handwriting on the handwritten declaration of the candidate is found to be dissimilar/different, as per expert analysis, the candidature of the candidate will be cancelled.